In Everyday Life, What People want? Do you think this is same for all people? People want to be happy and loved. You see this everyday on a number of levels and across all ages. Ultimately people just want to feel included, like they belong and that they matter. Some people work hard for it, some people think it will come automatically. Some people do not work at all. What they really want is a question to them also. What they desire is to be better than the nearest more successful person. And there are people who are above all these petty affairs and it is those people who experience the true happiness. 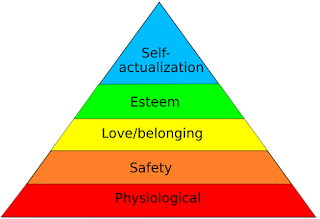 According to Maslow's hierarchy of needs, the physiological, safety, belonging and love, esteem, self-actualisation and self-transcendence are things what people want in their Everyday Life. It can be better understood with the help of a pyramid. In this pyramid, most fundamental needs are at bottom and self actualisation layer at the top of pyramid. This pyramid suggests that the most basic needs must be met before the all other needs related to someone individual. The human mind and brain are the two different things which generate different processes at the same time and this is the reason for priority of needs. Hence there is a need to be focused on identifying the basic types of motivation and the order in which they should be obtained. People want, at the deepest level, are the feelings that come with emotional stimulation. Whatever we want to do, there are components of emotional stimulation that are rewarding and motivating. If action is not possible, then imaginary action is indulged in for those feelings, as in reading, watching movies, daydreaming, taking recreational drugs. All that we desire has associated feelings that are craved, which motivates the behaviour toward fulfilling desires. The trouble is, this is a short sighted way to exist, and we end up chasing one impermanent set of feelings only to see a need to chase a different set of feelings. It becomes an endless, wandering process that can eventually take us into places of suffering. It could be described this way: Figments of our desires, leading us on, endlessly through time. Whatever it may be, what everyone wants is totally related to one’s satisfaction. And people want what they haven’t. Here requirement and satisfaction are playing important role. Firstly we comes to requirement of people, they may want to have better life, to look better, to be rich, to be successful, to have more money, to live forever, to be happy always, goodness, to feel valuable, peace of mind and a lot of things people want in their everyday life, for those things they work harder to earn them but is really all these things make them truly happy. I think what people want is intrinsically happiness. They want money because they can buy what they want. They buy what they want because they can bring happiness. They need love, family, friendship in order not to be lonely because they want happiness. Philosophically speaking, most people are utilitarianism. Everything they want and they do is because they want to get more happiness. Everyone wants something different in life. Some people might want love, money or fame. So it really depends can you be more specific? People want to be loved, appreciated, credited, played, esteemed, live with dignity, have leisure time, job, education, opportunities, health, wealth, property etc. How many people could live without computers? Nowadays they are not only needed by so many people, in their jobs, or simply could not do without: many people would feel lost without the web now, whereas they were totally happy without before. There are a few things we all want. We want companionship. All the way back to our ancestors we coalesced into groups, small and large. On one level, having companionship gives you greater security. For example, if you're alone you are more vulnerable. This applies to humans and many animals. On another level, given that humans have developed into emotional creatures, companionship allows us to have emotional support from others. We have conditioned ourselves this way for a long time. There are probably a few people in this world who don't need companionship. They are rare in my opinion. People base their wants on their emotional needs. Some people want money, because they believe money will solve their problems. Maybe they were raised this way. I know people who grew up very poor, but have made a success of themselves and acquired a good sum of money. They are very frugal with their money. They put a tremendous value on it. I think they do this, because psychologically the money eliminated the psychological pangs of poverty. They want to remove that poverty mindset that they had to grow up with.